· Industry Research & Tech. Progs. The Department of Horticulture and Landscape Architecture's research and teaching facilities are among the best in the nation. The Horticulture Building was dedicated in 1926 and has undergone considerable renovation over the years while retaining the ambiance of a "mature" structure. Over 12,000 sq. ft. of laboratory space has been modernized in recent years to accommodate growing research and teaching programs in the department. These labs are equipped for research and teaching in plant physiology, plant molecular biology, postharvest physiology, biochemistry, genetics, cytogenetics, plant tissue culture and biotechnology. In addition, Horticulture faculty occupy laboratory space in the Whistler Hall of Agricultural Research, a modern facility devoted to biotechnology research. Purdue University provides researchers with excellent core facilities in mainframe and supercomputing, GC-MS, electron microscopy, genomics sequencing through the Agricultural Genome Initiative, oligonucleotide synthesis, peptide sequencing and synthesis, and antibody production. In 1998, the Department completed a 7 million dollar project to construct new plant growth facilities. Currently in use are over 30,000 sq. ft. of greenhouses, which are supported by a 16,000 sq. ft. headhouse and laboratory facility. The 24 greenhouse zones are each controlled using Priva Computers Inc. sensors and microprocessors using Priva Supervision software. With this state-of-the-art system, the greenhouses can be controlled remotely with wireless hand-held computers. The headhouse includes growth chamber facilities and 2 large (900 sq. ft. each) controlled environment rooms for large scale plant production in a constant year round environment. In addition, this facility houses a 2,000 sq. ft. laboratory to support plant biotechnology efforts. The Department of Horticulture and Landscape Architecture at Purdue University brought on-line a $7.2 M world-class 31,400 ft2 plant growth facility in March 1998. Eighty-year old wood and glass greenhouses were razed to make way for a facility consisting of 25 greenhouse rooms, two growth rooms, 5 walk-in refrigeration units , 14 reach-in growth chambers, tissue culture lab, offices and 113 m2 (1260 ft2) potting area. Each 108-m2 (1200-ft2) greenhouse room is computer-controlled using sensors, microprocessors, weather station and Priva Computers, Inc. software. Weather station data of light, temperature, humidity, rain, wind speed and wind direction enables the microprocessors to anticipate heating and cooling requirements. This anticipatory logic function gives accurate temperature control while minimizing equipment cycling. The computers log environmental data and equipment usage every five minutes. The greenhouses​ are heated with hot water and cooled using active ventilation and evaporative cooling. No vents are present in the ridge or sidewalls (other than fan shutters), allowing for a better seal, reduced maintenance, and reduced insect pressure. Clear water and fertilizer solution are independently plumbed into each greenhouse, and reverse-osmosis purified water plumbed into nearly half of the greenhouses. Compressed air for aeroponic/hydroponic culture and computer ports for specialized equipment are also available in each greenhouse. The computer ports can be linked to Purdue's server network, allowing investigators to log and examine data remotely using dial-in access, or use web-cameras. Approximately 30% of crops are irrigated automatically using drip tubes or dribble rings. In some greenhouses, computers trigger on irrigation solenoids based on accumulated sunlight level. Within the 4500-ft2 headhouse, two 81-m2 (900-ft2) growth rooms have control features similar to the greenhouses including compressed air, clear water, purified water, and fertilizer solution and environmental monitoring. Fifty-four metal halide and 36 high-pressure sodium lamps (400-watts each) distribute up to 250 µmol/m2/s of PAR at bench top level. Chilled water exchangers are used to cool the room, and a minimum 15% fresh air is added with each air exchange. Five walk-in refrigeration units provide cold storage,fix seed treatment, vernalization and space for cold hardiness research. Six reach-in Conviron E8 growth chambers of .72 m2 (8 ft2) and eight Conviron E15 of 1.4 m2 (15 ft2) growing space are linked to a central computer for monitoring and control similar to the greenhouse system. The University supports core-facilities that can provide investigators with services such as DNA synthesis, DNA sequencing, peptide sequencing, peptide synthesis, mass spectroscopy and the electron microscopy. HLA faculty and staff utilize these facilities. Some of these facilities are managed by the department and are described in more detail later in this section. Classrooms: The Horticulture Building has one 90-seat lecture room under the control of University Space Management. This room is equipped with video and computer projection as well as slide and DVD/VCR capability. Many of our courses are assigned to this room, as is our weekly departmental seminar series. Some of our larger enrollment courses can no longer fit into this room and must be taught outside of the Horticulture Building. The Horticulture Building also has one 30-seat lecture room. We have scheduling control over this room and it is used extensively for upper level undergraduate and graduate courses within the department. This room is equipped with video and computer projection as well as slide and VCR capability. Laboratories: The headhouse to the old greenhouse range was remodeled and serves as the teaching laboratory facility for the department. Three rooms within this building are used for undergraduate instruction. The laboratory houses a high-speed centrifuge, UV-visible spectrophotometer, fluorescence spectrophotometer, gas chromatograph, HPLC, photosynthetic gas exchange equipment, pressure bombs, osmometers, oxygen electrodes and other general laboratory equipment. There are two small rooms in the old headhouse that hold plant growth chambers, ovens, and refrigerators used in our teaching program. In addition, we utilize the plant tissue culture facilities in the new headhouse when teaching tissue culture techniques in our undergraduate courses. Teaching Greenhouses: Greenhouse space is assigned specifically for teaching purposes. Extensive greenhouse space in our new greenhouses is utilized for HORT 101 (fall and spring), HORT 201 (spring) HORT 301 (fall) and HORT 401 (spring). Our greenhouse manager works to separate the space used for teaching from that used in our research and extension programs. We also have a small greenhouse adjacent to the old headhouse. This area is used for HORT 360, Flower arrangement and indoor plant management. Studios: There are four studios in the Horticulture Building to accommodate our landscape architecture and landscape horticulture and design programs. Students that enter our Professional Landscape Architecture Program (admitted following a screening procedure during the first year) have access to assigned studio space for the remainder of their program. The sophomore studio, room 310 HORT, can accommodate ~28-30 students. The junior studio, 225-226 HORT, and the senior studio, room 301 HORT, can each accommodate the 20-26 students typically enrolled in each class. All studios are outfitted with drafting tables or desks plus additional worktables. We recently were able to upgrade the furniture in the senior studio so those students can have space for both drawing and computer-aided design. Students in all studios can link to both the University and HLA computer network through wireless network access. Room 117B Horticulture serves as a studio for our landscape horticulture and design program and for our introductory graphics course. Drafting tables in this studio are not assigned to individual students as this studio is used for a number of classes. When classes are not meeting in 117B, students can use this room to work on class projects. A room adjacent to 117B has lockers where students can securely store their materials. Instructional Computer Laboratory: Room 204 Horticulture, the Hafele-Stinson Resource Center, is an instructional computer laboratory. The lab was completed in 1999 and currently consists of 20 workstations with network access to the campus network and the internet, an LCD projector connected to one of the workstations, 3 flatbed scanners, 1 black and white laser printer, and one color tabloid size printer. In addition we have two large format (36” wide) color printers and a large format (40” wide) scanner. All workstations have DVD-RW drives so the students can backup large files. Software packages available on the workstations include Microsoft Office 2010, Adobe Creative Suite 5 (includes Adobe PhotoShop, InDesign, Illustrator), AutoCAD 2010, VizTerra, Land F/X, Dynascape , ArcGIS, and SketchUp Pro. When not used for classroom computer-aided instruction, this room is available to HLA students. The instructional computer laboratory is open 24 hours a day and 7 days a week during the academic year. The twenty workstations and associated hardware are used extensively by landscape architecture students for computer-aided design and developing presentation graphics. Horticulture undergraduate and graduate students also use this room. As more of our courses use web-based teaching resources, the pressure on this room increases. An analysis of computer-use during fall 2001 indicated that the average workstation was used in excess of 60 hours per week. Despite this pressure, we do not intend to add an additional instructional computer laboratory. Instead, we are pursuing two separate alternatives. A wireless, mobile cart with 24 tablet computers equipped with wireless networking was purchased. This allows for a mobile classroom with computer capabilities for instructional purposes. Secondly, starting in the Fall semester of 2007, we will require our junior landscape architecture students to obtain their own laptop computers with wireless networking cards. Students will be able to perform computer-aided design in the landscape architecture studios. We intend to continue providing network infrastructure, software and associated peripherals. Both of these alternatives will reduce the pressure on our current instructional computer laboratory, yet enable us to continue to meet the needs of our students and faculty. Plant collections and outdoor laboratory space: The department maintains a display garden adjacent to the Horticulture Building. This garden is used as an outdoor laboratory for HORT 218 Herbaceous Landscape Plants and other classes. The garden is also used for Master Gardener activities and is maintained for the general enjoyment and education of the community. HORT 217, Woody Landscape Plants utilizes the entire campus as a plant collection resource. The department teaching program also uses the Maxwell Tract and plantings at the Horticulture Farm and Meigs Farm for educational purposes. As of 1997, the department operated a 147 acre vegetable farm (O'Neall Memorial Farm), a 265 acre fruit farm (Horticulture Research Farm), and an ornamental field research facility (Maxwell Tract). These farms were managed by two administrative/professionals and further supported by two technical positions. The Purdue Agriculture Research Centers Office acquired additional property close to the Throckmorton Agriculture Center, which is located approximately 10 miles south of Lafayette on Hwy 231. A committee developed a plan to consolidate all horticulture farming operations at this location, placing these activities under the direct management of the Office of Agricultural Research Programs and the Purdue Ag Centers. This plan calls for the construction of a new classroom/office building, equipment storage facility, cold rooms, greenhouses, container production area, and the development of extensive irrigation for fruit, vegetable, and ornamental research. The administration is committed to the Throckmorton Ag Center becoming a strong, state-of-the-art horticulture farm and has approved the planned consolidation and relocation of our farming operations. Our vegetable research activities were moved to Throckmorton / Meigs Farm several years ago. Our fruit crops research is being transferred over an extended period. New plantings of fruit trees and grapes are established at the Throckmorton / Meigs Farm and we plan to close our current fruit research farm in 2005. The consolidation of farming operations at Throckmorton should increase the efficiency of these activities. The department is committed to making this a smooth transition and will continue to work closely with the administration to develop an excellent facility for field research of horticultural crops. The Department of Horticulture and Landscape Architecture benefits from an extensive computer network that is connected to the Purdue Data Network. This network is maintained in conjunction with the Information Technology at Purdue (ITaP) organization. The network supports both Macintosh and Windows platforms and currently connects over 195 computers and 50 network devices (printers, web cams, wireless access points, etc.) within the department to the campus network. In order to provide technical support related to computing services and in an attempt to keep pace with the changing technology, the department has 2 full time Computer Specialists. Carl Geiger and Kirby Kalbaugh bring considerable expertise to the Computer Support Services area and support our ability to use computer technology in all our programs within the department. The department provides facilities and services in several areas. We provide file server access and storage to both the Mac and Windows clients, database servers which provide data for several web sites, data backup for the servers as well as individual machines within the department and remote network access for faculty and staff. We also provide digital cameras, as well as LCD projectors and laptop computers (Mac or Windows) for presentations. Graduate student offices are equipped with computers, printers, and scanners. All of our classrooms are hardwired with computer network access. Our large lecture room has a permanent computer connected to the campus network and a LCD projector. A second classroom has a permanent LCD projector installed with a hook-up for a laptop computer. In 2002, the Horticulture building and the Horticulture greenhouses were among the first buildings in the School of Agriculture to be equipped with campus wireless networking. The wireless coverage includes the classrooms, conference rooms, offices, and labs. The department maintains a major web site that includes information about our various programs. This site averages just over 1 million requests a month and has served as an additional vehicle for communicating with our clientele. Certainly, we have noted a significant increase in inquiries by prospective students through our web pages. Increasingly, faculty members are using the Web as a source of information in courses. Several faculty members have established extensive web pages for their individual courses. As well as the department web server, the faculty also has access to WebCT on the university server for developing instructional web sites. While the cost of developing and maintaining state-of-the-art computing facilities is significant, we feel that the department has made significant progress in this area over the last few years. Furthermore, we are committed to the continued development of computing facilities related to all our departmental programs. Click Here for IT Technical Information. The Life Science Microscopy Facility is a core facility under the umbrella of the campus-wide Purdue Electron Microscopy Consortium (PEMC) and supported by the Schools of Agriculture, Science, Pharmacy and Veterinary Medicine. It is administered through the Department of Horticulture and Landscape Architecture (HLA) in the School of Agriculture. Located in the Whistler Research Building, this 4000-sq. ft. laboratory complex supports research on microscopic and submicroscopic structure of biological and physical systems and is available to the campus community. Originally established in 1983 to consolidate ultrastructural technology in the Agricultural Complex, the LSMF has served research needs of a wide range of programs from basic molecular biology and cell biology to applied agricultural and engineering research. The main functions of the LSMF are to provide equipment, training (SEM and TEM courses), space, advice, and expertise so that researchers can come to the laboratories to conduct their research efficiently. There are both multi-user and service options available. The facility contains research equipment for use by students, faculty, postdoctorals, and service staff. 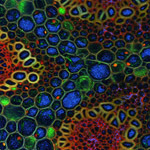 Technology in the LSMF provides capabilities for light microscopy, transmission electron microscopy, scanning electron microscopy , computer-based image analysis, photographic processing and digital printing, ultramicrotomy, critical point drying, vacuum evaporation, sputter coating, and histological and cytological specimen preparation. Staff in the LSMF provides expertise in a wide range of specialized preparation techniques including immunocytochemistry and freeze substitution to assist researchers. 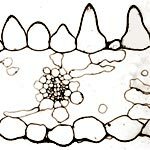 Image by Dudareva lab. TEM: two transmission electron microscopes (FEI/Philips CM-10; FEI/Philips CM-100). SEM: JEOL JSM-840 scanning electron microscope equipped with a Hexland CT-1000 cryogenic specimen preparation system with an SEM cold stage and digital image acquisition. SEM prep: Hummer sputter-coater and LADD critical point dryer. Olympus Vanox photomicroscope system with phase contrast, DIC, polarization, fluorescence, and bright field optics, and film, video and CCD cameras. A Nikon E800 photomicroscope with bright field, DIC and fluorescence optics is also equipped with film, CCD and video cameras. Video cameras interfaced with video-enhanced contrast technology, real time digital image processors, and time lapse video recorder; recording in VHS and S-VHS formats with tape editing capabilities and a digital measurement system. Two routine research grade microscopes (Nikon Optiphot and Zeiss WL) are equipped with phase contrast and differential interference contrast optics. Nikon SMZ-U research grade zoom stereo microscope with 35mm photography, Sony color CCD video camera, and Spot RT cooled CCD digital camera. Computer systems: includes a high resolution scanner, digitizer, video-cameras, laser printer, a Codonics NP-1660 dye-sublimation printer and an ink-jet printer. Software includes Microsoft Office, Photoshop 7, Scanalytics image analysis programs, etc. This facility is a joint effort of the Colleges of Agriculture and Science at Purdue University, and is for researchers in the life sciences. The objective of the facility is discovery. Our mission is to enhance discovery, facilitate the inclusion of cell biology in all life science research, and make it possible for all Purdue researchers to have access to the highest quality imaging technology at reasonable cost. You have access to state of the art Zeiss upright confocal microscopy and Intavis robotics equipment. The facility is user-driven. That means that you get basic training about using the equipment, and then you get to do your experiments without someone looking over your shoulder. The Purdue University Genomics Facility is a campus-wide core facility supported by the University and managed through the Department of Horticulture and Landscape Architecture. The Center has 2000 ft2 of laboratory space and 300 ft2 of office/storage space within the Whistler Agricultural Research Building. This Core Facility has three main functions: sequencing, Affymetrix GeneChip analysis, and robot-facilitated arraying and re-arraying. Sequencing is performed on an ABI 3700 sequencer. 4800 sequencing reactions can be performed and run to generate approximately 2.4 megabases of high quality sequence per week. Plate centrifuges, a Biomek 2000 laboratory robot, 384-well thermal cyclers and various multi-channel pippetting devices make this throughput possible. Back-end support for our sequencers is provided by a four-processor Sun Enterprise 450 with four megabytes of RAM and over 400 gigabytes of disk space. 100 megabit/second network connections link the Genomics Core with the Enterprise 450 and the rest of Purdue University. Our bioinformatics specialist maintains various genetics programs including the GCG and the phred/phrap/consed package and writes new software when appropriate. Accounts for genomics research are free to Purdue University faculty and their lab members. The Facility also supplies low-throughput custom sequencing services. Sequences are returned with blast searches already performed and chromatograms viewable on our Low Throughput Lab web page: http://www.genomics.purdue.edu/ltl/. Interested labs are supplied there own password-protected web page where they may access their data. The Genomics Center will begin accepting total RNA samples for analysis via our Affymetrix Complete GeneChip System in February 2003. This system includes two GeneChip Fluidics Stations and two GeneChip Hybridization Ovens and a GeneArray scanner. The Genomics Facility also has a Biorobotics Total Array System (TAS) for arraying. TAS also spots bacteria onto nylon filters to create high-density bacterial filter arrays. The contents of 24 microtiter plates can be gridded onto four (22 cm)2 filters in 15 minutes. Between 2304 (1x) and 82,944 (36x) clones can be spotted per (22 cm)2 filter. For those wishing to analyze spotted DNA microarrays, we provide a GSI Lumonics ScanArray 4000 3-laser slide scanner. It reads the intensity of hybridization of flourescently-labelled probes to a microarray. A full slide requires roughly 15 minutes to scan. We have a Genetix Qpix that picks bacterial colonies from 22x22 cm trays containing agar-solidified medium into 384- or 96-well plates at a rate of 3000 colonies per hour. Further, utilizing the Qpix in rearraying mode, specified wells of glycerol stocks in 384-well plates can be inoculated into fresh glycerol stocks. Thus a high-density bacterial filter replica of a library contained in 384 well plates could be hybridized to a probe—perhaps cDNA from a tissue of interest—and the colonies hybridizing to the probe can be tabulated using a software package we provide. This table of clones of interest can be used by the Qpix to create a sub-library from the original containing the clones of interest. Additional, we can create blunt-end shotgun libraries of BAC, cosmid or bacterial DNA for those wishing to do high-throughput sequencing. Although supported by the University, services at the Genomics Center are supported through recharge to investigator grants and contracts. This billing is conducted through the HLA Business Office.